One amongst the several sacred places in India, the Char Dham and the Do Dham Pilgrimage, Gangotri is a popular revered site for Hindus. 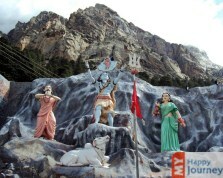 It is a place of the origin of river Ganga, which is also recognized as River Bhagirathi among locals. Located 19 km away from Gangotri region, the Ganga originates in the Gangotri Glacier from the Gaumukh. As per the legends, the river is devoted to the divinity Ganga, who in order to forgive the sins of King Bhagirathi’s forefathers, after his stern atonement, took the form of a river. Afterwards to lessen her flow, Lord Shiva had to detain River Ganga in his thick hair locks. Later in the 18th century a temple was established by the Gorkha Commander Amar Singh Thapa, within the town which is well known today as the Gangotri Temple. While you visit this ancient shrine you can see the beautiful artifacts and religious rituals which are performed by the pujaris. However, the major attraction among tourists is the evening Aarti ceremony. Devotees come all the way to have the glimpse of this divine celebration and have blessings of the goddess Ganga, who is worshiped here. Gangotri has various excursions for the tourists, namely Kedarnath, Badrinath, Valley of Flowers, Jalamagna Shivalinga, Bhavishya Badri Temple and many more in its surroundings. Along with this the place is famous for adventure sports. Trekking, river rafting, skiing and camping are some common activities popular among tourists. Moreover, due to its close proximity with the Himalayan range and the sylvan surroundings, a visit to this place becomes even more pleasant and enjoyable.